While we’ve had DHL Global Mail for a few months now, we’ve heard from you guys that you’d like to have DHL Express, as well! Now your request is granted, and you’ll be able to hook up your DHL Express account (or create a new one) and start printing labels. We support both the Express Worldwide and Express Envelope services, with the former being for packages over 10 oz, and the latter for packages under 10 oz. Every package that is sent through DHL Express automatically includes free Electronic Signature, as well. 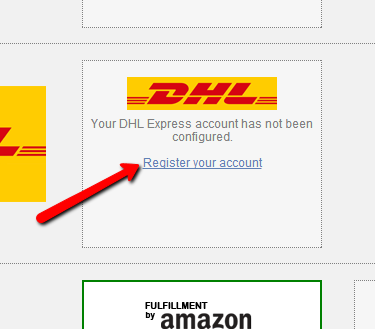 So, why use DHL Express? Simple: they’re the carrier for shipping internationally. When USPS rates increased back in January, it caused problems for all of us, and some eCommerce merchants stopped using the service altogether for international shipments. DHL Express is here to help cover that gap so that you can either start up or continue to offer shipping to international sellers for a reasonable price. Interested? All you need is your DHL Express account #. Simply sign into the app, and click on Settings, and then Fulfillment / Shipping Providers. …paste in your DHL Express account #, and click Next! Now you can generate labels for your international shipments for DHL Express!